So you’re in the market for a new Grinder Polisher. New machines are being released at such an alarming rate that you don’t know where to begin when considering one. What’s really important? What could you live without? Where do you get the most for your money? Whether this is your first grinder polisher or you own a fleet of them, let’s take a look at exactly what a grinder polisher does, and 3 of the most important things that guide you when determining which is the best one for you. 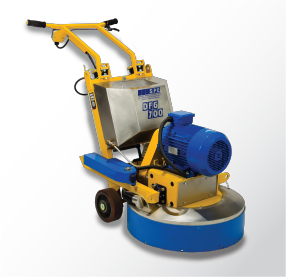 Chances are you know what a grinder polisher is, but to review, despite the many different sizes and variations, the primary purpose of a grinder polisher is to do exactly that: grind your concrete floors, and then polishing your way back up. Additionally, these machines can be used for removal of adhesives, mortar, coatings/membranes, and so on. For the sake of our series, we'll primarily be focusing on how these machines grind and polish. For as many different methods of doing this, there are as many different machines to help you get there. What remains the same between all of these machines is the plate(s) on the bottom of the machine rotate to grind and polish. Diamond tooling is attached to these plates and will be changed out during different steps of the process (similar to sanding a piece of furniture, you start with a coarse grit and work your way to a finer grit). Grinder Polishers are primarily produced in single head models up to six head models, with the most common being 3- to 4-headed machines. Which model you choose depends on a number of key features. Depending on whether you primarily prepare the floor, polish it, or both, you’ll need a certain machine that can handle what you throw at it. Planetary grinder polishers have an advantage over rotary grinders in the way they cover a larger surface area more evenly. Planetary grinders tend to be better balanced than their rotary counterparts, and the more heads on a planetary grinder, the more evenly distributed weight, thus less operator fatigue. 4-Headed grinder polishers seem to hit the sweet-spot between balance and production rates for most contractors. 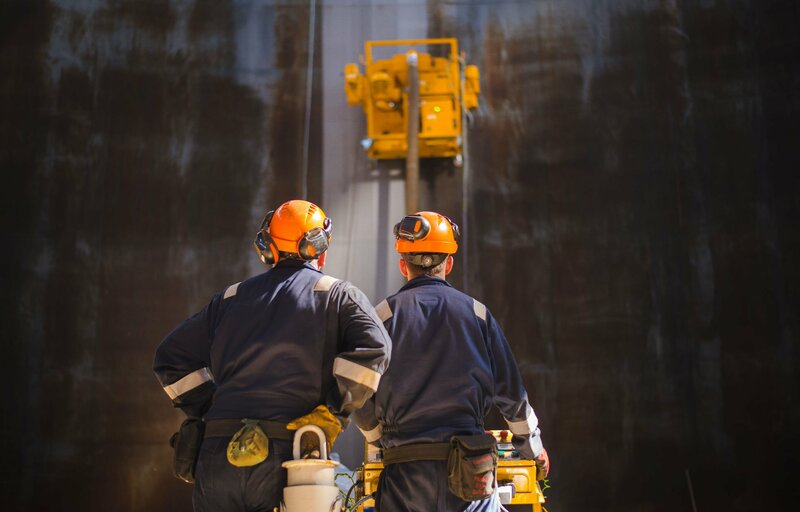 In simple terms, less heads on the ground means more downward pressure per plate, and thus more energy directed into grinding down your floor. 3-headed planetary grinders are great for the contractor who primarily grinds as the weight of the machine is more concentrated, thus helping you get the most out of your grinding experience. On the other hand, a 4-headed planetary grinder is especially good at polishing. A more even distribution of the machine’s weight allows the heads to spin faster, thus really allowing your polishing to be effective. The larger surface area also helps production rates as it takes less time to cover a warehouse than with a smaller machine. That being said, both 3-headed and 4-headed planetary machines can be used for grinding and polishing. 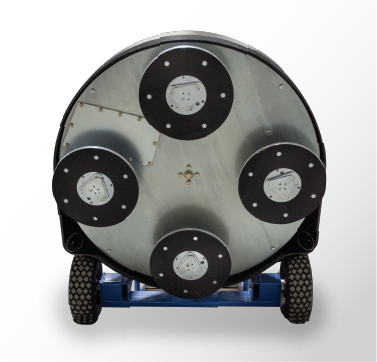 Add-ons like swing weights can make a 4-headed grinder polisher that much heavier, thus reinstating the loss of downward pressure that a 3-headed machine can more easily get. A 3-headed machine can also polish quite effectively; it just may require a little more time because of the more concentrated surface area. As it pertains to floor removal, the principles of what makes a great floor grinder are shared. Less heads on the ground mean a more aggressive removal. 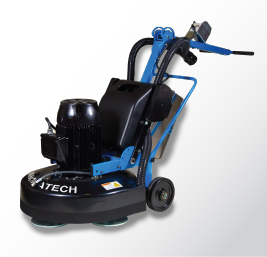 Planetary floor grinders give the contractor more options when it comes to removal tooling. In most circumstances, heavy machines are needed for general and serious removal. Pertaining to our first key feature, whether grinding and polishing is your full-time job will be a major factor in picking a machine. For the contractor who only occasionally does one or the other, you might be better suited to a smaller machine that can be transported easier but still get the job done in small environments. 3-headed and 4-headed machines tend to be bigger, requiring more effort to transport and store than their smaller counterparts. That being said, the production rates savings and more even scratch patterns might make it worth the extra effort. If grinding and polishing is your bread and butter, and the jobs you get demand you to be quick and cover a lot of ground in a short amount of time, that bigger machine with more features is the way to go. In a similar vein, the typical time frames of jobs you take on will dictate the size of machine you need. If you get jobs that have bigger timelines to complete them, taking your time with a smaller machine might be a more appealing option. Inversely, if time is a major factor and quicker is better, you might want a bigger machine to hammer out the job that much quicker. Of course, there are tons of other factors to consider when buying a grinder polisher, but these are three of the big ones that tend to make the biggest difference. Every contractor is different and every job he takes has different demands and expectations. The only way to learn is to get your hands dirty and give it a grind (and polish).